During the Nine Years War the English Army had become a force to be reckoned with in continental Europe. By 1700 it had however been reduced to slightly more than 20,000 men1, and seemed to revert to the situation under Charles II and James II. In fact William III had made lasting improvements to the English Army. By 1700 it was an army organized for modern warfare and experienced in major battles. The demobilization of 1697-1700 kept the organisation of William's army intact and allowed for a rapid increase in its numbers. The regiments of the English army are described on separate pages.The English cavalry and dragoon regiments. 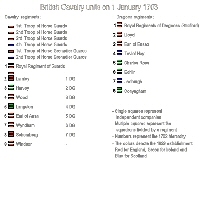 The infantry regiments of the English army are described on a separate page.The English Infantry regiments.. The 1660 restoration of King Charles II dismissed Cromwell's New Model Army. The safety of the kingdom would be in the hands of the militia and the fleet. The household troops and two regiments owned by General Monck would provide for the safety of the king. The Commons thus created a situation in which the standing army was so small that it could not hope to crush national resistance against royal ambitions. In time the Commons did however agree to an expansion of the army. The acquisition of Tangier in 1662 required regular troops to defend it, and because Tangier secured trade to the Mediterranean, parliament was prepared to pay for these troops. The Second Dutch War proved that it was good to have some regular troops in England, but did not lead to a major expansion of the army. Next to this English army there were also smaller Scottish and Irish armies. Of these the Irish was the more important because it was needed to keep a hostile Catholic population subdued. The Irish army also had a large and active Protestant militia component. King James II would have loved to crush internal opposition. The Monmouth rebellion was the opportunity he needed to expand the army. He raised 9 new infantry regiments and 7 cavalry regiments. Raising extra regiments in times of crisis had been done before, but this time James succeeded in holding on to these extra units. By these additions the English army had become a serious army in terms of size. With an army of this size James II could have enough power to overthrow the constitution.The king did however appreciate that the army was not so loyal to him that he could make such an attempt. He therefore started to appoint Catholic officers, and to raise a Catholic army in Ireland. The population saw quite clearly where this was leading, and so it invited William III to intervene. By the time William's invasion seemed imminent the English, Irish and Scottish armies reached a peak strength of about 45,000 men by hurried augmentations. After William III had landed an English army of about 20,000 men marched to Salisbury. While there senior officers and men started to desert and on the political level the same happened. For James it became clear that even though he was slightly more numerous, he could not hope to win against the crack troops of William's army10. His troops might very well flee at the first volley, desert en route, or even turn on him11. This made a disaster likely and meant that he could be killed or captured. With these expectations James went back to London and left England. One of James final acts with regard to the English army was to disband it in December 1688. The Irish army of James II meanwhile practically went to waste by neglect, desertion and transporting troops away. His vice-roy Tyrconnel did however assemble a new Catholic Irish Army in order to try and keep Ireland for James II. After the Glorious Revolution William III took over a much weakened English army. He immediately sent part of it to the Low Countries in order to fight in the Nine Years War. When a new list of the army was prepared in April 1689 it still numbered about 33,000 men of which about 11,000 in Flanders. William began to enlarge the army again and in less than a year the army officially grew to about 60,000 men at the end of 1689. This growth was attained by simply transferring the main part of the invasion force to the English budget and raising 17 new regiments with a paper strength of about 13,000 new troops. England also hired about 7,000 troops from Denmark, and the last of these arrived in spring 1690. This brought the total of foreign troops in English service to about 20,000. For the years 1690 till 1694 the strength of all British forces would then hover at about 80,000 troops. In 1694 and 1695 the army would again be augmented by issuing commissions to raise 3 cavalry regiments, 5 dragoon regiments and 12 infantry regiments. All in all this meant that for the years 1695-1697 paper strength of all British forces rose to about 100,000 men. As said William immediately began to engage his new subjects in warfare. For the Irish front this meant that in April 1689 about 9,000 English troops had been shipped to Ireland. In September 1689 these troops were augmented to 36 regiments and at least part of these suffered in the disasters of the camp at Dundalk. The disasters suffered at Dundalk brought the inexperience of the English Army to light. The troops were paid, but the officers stole the money and were ignorant of how a camp should be organised. The result was that the foreign troops suffered only lightly. The English troops however were in a dirty camp with insufficient clothing and died like flees. In 1690 there were 45 British and Irish regiments in Ireland and these were supported by 30 foreign ones. The first pitched battle the English Army fought in Ireland was the battle of the Boyne. Here at least 15 English infantry and 11 English cavalry regiments fought the French and Irish. Other major engagements were the siege of Athlone and the battle of Aughrim. As regards the continent Britain was obliged by the mutual defense treaty which the predecessors of the new king had concluded to come to the aid of the States General. This meant that at first about 10,000 troops were engaged in the Low Countries. These were then first reduced in order to concentrate efforts against Ireland. After the Irish threat was over more and more English troops were then engaged on the continent. In 1693 this lead to a situation whereby 45 cavalry, 9 dragoon and 44 infantry regiments in English pay fought in the Low Countries. The peak level of the British commitment in the Low Countries would be reached in 1695 when it paid for 94 regiments. In 1696 and 1697 this level would continue at about the same footing. On the continent this growing British involvement gave the English Army a first taste of continental warfare when it engaged in the battle of Walcourt. The English contingent fighting at Walcourt was commanded by John Churchill and it was lucky that before this engagement it had been integrated in the Dutch administrative and command organization. This meant that before this battle it had been retrained in the newest Dutch drill, but also that its provisions and pay were organized by the Dutch12. Later the English contingents participated in the battles of Steenkirk and Neerwinden and the 1695 siege of Namur. By the time of the peace of Rijswijk in 1697 England had a considerable, modern and experienced army. After the peace of Rijswijk parliament was bent on economizing. In December 1697 it stated that the army in England should count 7,000 men and that all regiments should consist of native Englishmen. Scotland reduced its army to about 4,700. The army in Ireland would count about 12,000 men. The measures taken by parliament roughtly meant that, except for the regiments which had already been raised by James II, all troops would be dismissed. In other words: The war is over and we return to the situation before the war. In fact England could not return to the situation before the war. By the change of government Ireland had become a potentially rebellious domain, but the threat to England itself had not diminished that much. Ireland probably needed the 12,000 soldiers assigned for its safety. England probably still needed the same amount of troops James II deemed necessary to fend of a potential invasion. In 1688 the Dutch had proven themselves able to land about 21,000 troops. In all probability the French, who were much closer, could also land and supply a comparable army. Therefore the 7,000 troops in England and parliament's reliance on the militia were quite foolish. A more realistic figure would be 15,000 troops in England, which could be mobilized to 25,000. At the time of the peace of Rijswijk England had about 100,000 men under arms. France made a large reduction in its armed forces and it was logical for England to do the same. Parliament wanted to cut down to 24,000. As seen above 32,000 would have been a more realistic figure for England's interests. King William thought in a European perspective and would probably have like to keep double that number. Of course the king strongly opposed parliament's measures, but he could only try to lessen their effects. Of the 5 March 1699 bill that lists the 7,000 men to be maintained in and by the Kingdom of England we have an early 1699 list13. Col. Francis Langton (13 Foot) Col. Sir John Jacob Bart. (10 Foot) Col. Sir Bevil Granvill Bart. 16 corp., 8 drum., 8 hoboys, surgeon and 286 privates in 8 troops. There are also 23 February 1698 and 16 March 1698 lists of regiments disbanded. The measures also meant dismissing about 23,000 foreign troops, of which 6 Scottish regiments (Lauder, Murray, Colyear, Strathnaver, Mackay and Hamilton) and the Brandenburg Regiment returned to Dutch establishment. In 1699 the Gardes du Corps (Blue Guard) and the (Dutch) Horse Guards were also dismissed and returned. Especially cold hearted was the dismissal of the Huguenot regiments that had fought so valiantly for England. The king succeeded in evading some of the worst effects of these measures by shipping his veteran troops from Flanders to Ireland and disbanding the fresh troops which garrisoned that kingdom16. Other measures were reducing the number of soldiers per company while retaining most of the officers and NCO's. This meant that the number of men in each regiment almost halved. This in turn enabled the king to retain a far larger number of units in his army than the reduction suggested. This meant that as regards units the British army went from a peak strength of 11 cavalry, 14 Dragoon and 67 Infantry regiments to a strength of 11 Cavalry, 9 Dragoon and 31 Infantry regiments. Of the native English infantry regiments that William III had founded (later 16, 17, 19, 20, 22, 23, 24, 28, 29, 30, 31, 32) we find that most still existed in 1751, even though 5 had been disbanded for a time. What's interesting to note in this respect is that of the 1699 strength 2 cavalry, 3 dragoon and 21 infantry regiments were on the Irish establishment, which leaves only 7 cavalry, 6 dragoon and 10 infantry on the Scottish and English establishments. Anyway, there is a consensus that the actual effects of the Commons' dictate were somewhat less dramatic than one would expect. The reasons for this can be found in the professional way the king handled the demobilization. Under Queen Anne the English Army saw some major revolutions with regard to its prestige. The first was the appointment of John Churchill afterwards Duke of Marlborough as commander of the Alliance Army. The first time since Medieval times that an Englishman commanded a main European army. The second was the Danube campaign, where an English army marched deep into Germany to serve the goals of the English government. In the 15 years between 1689 and 1704 England had developed from a power that only mattered in naval affairs into being one of the major forces in continental warfare. For the army of Charles II I've looked at the units actually present in the English army of the time and placed the whole into a fresh perspective. The same goes for James II's army, where the description can also stay rather limited. The pages that describe the individual units have the sources in the notes. For William III's army and its strength, organization and operations during the Nine Years War I have primarily used Stapleton's dissertation: Forging a Coalition army: William III, The Grand Alliance, and the Confederate Army in the Spanish Netherlands. 1688-1697. It clearly shows how in coalition with the Dutch, the English army left its amateur status and grew to be up to par with any other European force. The paragraph about the demobilization is based on the same work in combination with the unit histories. 1) Figures after demobilization: 7,000 for England; 12,000 in Ireland and about 2,000 for Scotland. 2) The fourth troop would be disbanded in 1683. 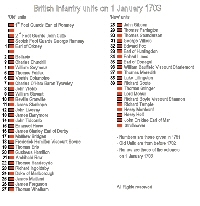 In 1751 the horse guards numbered two independent troops and were not yet regimented. 3) The Earl of Oxford's Regiment had been a cavalry unit of the NMA. In 1750 it would become the Royal Horse Guards Blue. 5) This had been Monck's Regiment of Foot of Cromwell's NMA, also known as Coldstream Guards. 6) The Royal Scots were a Scottish regiment, and had come to England for the restoration. In 1751 it became the first regiment of the British army. 7) The Tangier regiment was raised in 1661, in 1663 it absorbed two others. 8) The Holland regiment was formed in 1665 from English troops serving the Dutch. 9) The second Tangier regiment was raised in 1680. 10) Crack in the sense that William's troops all had combat experience. 11) More than half the English units had never been under fire and this made them prone to panick. Most men were also badly motivated and didn't trust each other. One spark of panick would have been succeeded by: 'We are betrayed' and the whole English army would have fled or deserted on the spot. 15) Ferguson vol. 2 page 4 has a note about a letter written by the commander of Ferguson's regiment. It's stated to say that there were other regiments on the Scottish establishment; like: Portmore's; Strathnaver's; Hamilton's; Maitland's and Jedburgh dragoons. 16) See Stapleton: Forging a coalition army page 133.